A bride has been spotted kneeling to greet guests at her own wedding with the husband following. 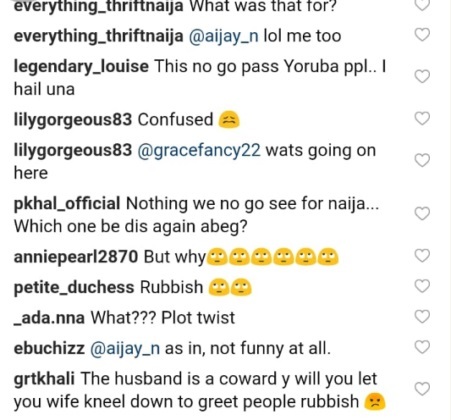 Nigerians have taken to social media to express disappointment after a photo of a Nigerian bride kneeling to greet guests on the high table during her reception emerged online. 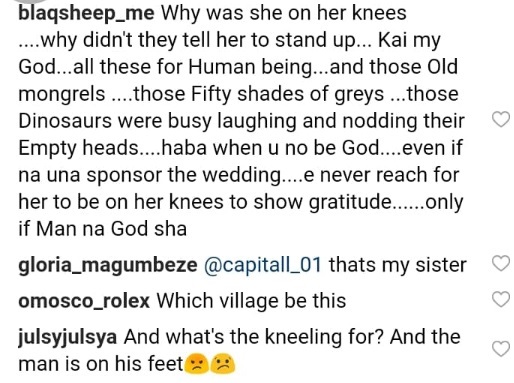 Some are of the opinion that this habit of making women kneel down as a sign of respect should be abolished as many women have done this and then gone ahead to show their true self when they settle into matrimony. Eyaaaaaaaaa! This bride is very cultured with manners, look at how she knelt down respectfully to greet the elders... Awwwwww.. VERY STUPID.